The latest subtraction from the Bills receiver corp came in a surprising announcement Sunday night. 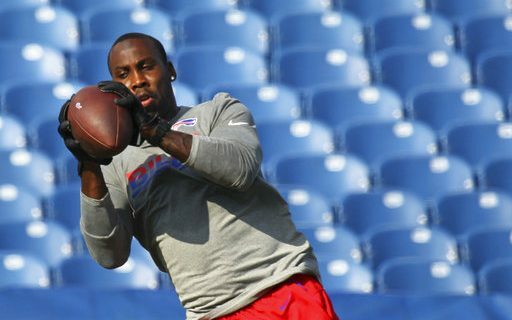 Anquan Boldin announced he is leaving the Bills, and will retire at the age of 36. Boldin made the announcement in a statement to ESPN NFL reporter Jim Trotter. Saying “my life’s purpose is bigger than football” is a noble and respectable reason for walking away from the game after 14 seasons. That should put to rest any speculation that the is retiring because of the Bills rebuilding, the Sammy Watkins trade or Tyrod Taylor’s preseason performance. The Bills issued a release later on Sunday. The effect on the Bills is immense. Boldin figured to be the team’s #1A or #2 receiver since the Watkins trade. Jordan Matthews, when he’s healthy, now clearly becomes the team’s top wideout. Boldin was going to give the team a target in the middle of the field that they have lacked. He was also going to be the mentor that any team’s young players need. Now all of that is gone. Rookie Zay Jones has no choice but to become the Bills #2 option at receiver. He’s coming off a good performance against the Eagles, and appears ready to accept that role. He probably moves back to the slot, a position he held before the Boldin signing and one he dominated in college. Who’s the #3 receiver? That jobs looks like it will belong to veteran Andre Holmes. Not exactly what he’s best suited for, but his six-foot-four inch size could be an asset. The Boldin retirement also seems to lock in the roster spot of Corey “Philly” Brown. The veteran signed from Carolina also plays the slot, and brings a veteran presence to the receiver room. Veteran Rod Streater was having a great training camp, and could have been pushing Holmes for a starting position. But he injured his toe in Philadelphia, and head Coach Sean McDermott said Sunday that the team is “weighing their options” about surgery. With return man Brandon Tate taking another receiver spot, if the Bills keep six than one of the young players (Lewis, Powell, Reilly, Ross, Shorts) would have a shot to stick. The Bills could also look to pick up a waiver player or sign another veteran. No matter what, the position is significantly weaker than it was just over a week ago when Watkins and Boldin wore the red and blue.